Back when he was in high school, The Curmudgeon celebrated the end of school one year by getting on his bike and riding to Hardee’s, which had a short-lived restaurant near him, for his favorite sandwich at the time: the Husky Junior. While riding home, he placed the bag of food in his one-speed bicycle’s basket (stop that right now: it was incredibly useful and practical and he remains stubbornly unapologetic about it. In fact, if he lived someplace today where you could get on your bike and run errands without risking your life he wouldn’t hesitate to get a basket for his current one-speed). As he was riding, though, the bag opened and a few fries spilled out. The Curmudgeon reached for the bag and the fries and the next thing he knew he was sprawled on the street, bleeding and bruised, his bike atop him. So The Curmudgeon considers himself lucky to have learned about the perils of distracted driving before he was actually driving. We hear a lot about distracted driving. People talk on the phone while driving, people text while driving, people eat and drink while driving, people surf the web on their phones while driving, women apply make-up while driving, television commercials depict men using electric razors while driving. The Curmudgeon recalls once going on a date with a woman who was already driving way too fast in her little Porsche Cayman and she was eating and applying make-up at the same time. The Curmudgeon wanted to tell her that she shouldn’t do either while he was a passenger in her car but because she had the kind of temperament that suggested he might be in jeopardy of being invited to walk home, he gently suggested that she do just one or the other but not both while she had a nervous passenger. But ABC news reports a new twist in distracted driving. According to a startled Florida Highway Patrol trooper, [Megan] Barnes was shaving her bikini area while driving south on the famed Overseas Highway when she crashed into the rear of an SUV March 2. In the police report obtained by ABC News, the trim job was apparently essential because the arresting officer, trooper Gary Dunick, said the Indiana native told him she was heading to Key West to visit her boyfriend. And the task apparently required assistance. In order to pay full attention to her sensitive regions, police say Barnes enlisted her ex-husband, Charles Judy, who was riding shotgun, to hold the wheel. So remember, readers: never trim and drive. Alibaba is: a) the guy with the forty thieves; b) the largest internet retailer in the world; c) a company that just completed the biggest IPO ever; or d) the name on Barack Obama’s Kenyan birth certificate? Texas is using game wardens to help patrol its border with Mexico because: a) in a crisis, it needs every bit of help it can get; b) game wardens are great shots; c) anything is better than asking for help from the federal government; or d) shoot coyotes, shoot Mexicans, makes no difference to Texans? Many legal marijuana dispensaries are having trouble finding banks to take their deposits and handle their business. The banks are reluctant because: a) they believe a provision in federal law makes it illegal for them to do so; b) the dispensaries have refused to give them special discounts; c) fear of getting a contact high; or d) banks have a highly developed sense of right and wrong and believe that making money doing something of questionable propriety would be wrong? Miss America has been criticized because while she was in college she had an internship with Planned Parenthood. Conservatives have expressed outrage over this because: a) Miss America is not supposed to use her brain for anything; b); it means Miss America is an abortionist; c) it means that because all young girls view Miss America as a role model, when they grow up they’ll all want to perform abortions; or d) it was a slow news week and they had nothing better to complain about? The most important support Ukraine has received in its battle to survive Russia’s imperialist thrust has been: a) munitions from the U.S.; b) money from Germany to rebuild infrastructure; c) cash from Great Britain; or d) lessons in how to surrender from the French? A new search for Amelia Earhart, scheduled to begin last month, has been postponed for one year because: a) the would-be searchers needed more time to get ready; b) the project ran out of money; c) the would-be searchers got a life; or d) they figured Earhart’s not going anywhere? Pennsylvania is the latest state to consider permitting teachers to carry guns in the classroom. It’s doing so because: a) everyone has a right to carry a gun – it’s right there, in the bible; b) violence in schools shows that students need protection; c) teachers have been on the receiving end of too much violence in the classroom; or d) something needs to be done once and for all about that kid in the third row who’s always shooting spitballs? As he has in whenever the U.S. sends soldiers into another country, New York congressman Charles Rangel is proposing that the U.S. reinstitute the draft and impose a tax to pay for the war against ISIS. He’s doing this because: a) he thinks people will think twice about supporting a war if they fear their children will get drafted; b) he thinks people will think twice about supporting a war if they have to pay a special tax to pay for it; c) he’s tired of poor people doing all the fighting and dying for their country and wants to level the playing field by giving children from middle-class and upper-income families the same opportunity; or d) he’s eighty-five years old and has a bad knee so he’s reasonably confident he won’t qualify to serve? ESPN suspended Bill Simmons, its star web site columnist and the founder, editor-in-chief, and commentator on its separate “Grantland” web site, after Simmons criticized NFL commissioner Roger Goodell’s handling of the Ray Rice case. ESPN suspended Simmons because: a) it doesn’t want sports journalists to be in any way critical of anything in the sports world; b) ESPN’s broadcasts of NFL games are extremely lucrative, which means keeping Goodell and the NFL happy is more important than keeping Simmons happy; c) it hired Simmons to give his opinions but it only wants opinions consistent with ESPN’s business interests; or d) the last thing ESPN wants is for its reporters and commentators to tell the truth about the subjects on which they’re commenting? House Republicans have threatened to cut in half the Obama administration’s request for Ebola funding because: a) they think he’s asking for too much money; b) Ebola doesn’t seem to be too much of a threat on American soil; c) if the president proposes it, they automatically oppose it; or d) Ebola primarily threatens Africa and Africans so really, who gives a damn? With the exception of one cousin, everyone descended from The Curmudgeon’s maternal grandmother suffers from the same digestive disorder. With a houseful of guests for Rosh Hashanah dinner on Wednesday night, The Curmudgeon’s teenaged nephew dropped something while eating and reached under a sofa table his uncle hasn’t moved since acquiring it six or seven years ago. When he sat up he held out a little blue pill (no, not THAT little blue pill) and questioned what it was and to whom it belonged. “Ah, Bentyl,” cried The Curmudgeon, his brother, and his sister, practically in unison. The other guests just raised their eyebrows, a combination of amused and confused. Any idiot can write a review of a television show he’s already seen. This idiot, though, can write a review of one he hasn’t. Tonight is the season debut of Saturday Night Live, and without seeing the show, without knowing who the host is, who the musical guest is (to be honest, The Curmudgeon only knows about fifty percent of the musical guests), and without knowing who’s gone from last year’s cast and who’s been added, The Curmudgeon can tell you what they’ll be saying around the water cooler on Monday morning – if, that is, they’re saying anything at all. Of course, if you ask most of these critics if they actually, you know, watched the show they’re talking about, or have watched it at all in recent years, they’re probably going to tell you they haven’t. But that’s not going to stop them from lamenting the passing of the show’s golden years, “When SNL was great and every sketch was funny” – which, The Curmudgeon assures you, was never, ever true. But last weekend, a young man named Cole Custer won a NASCAR race in New Hampshire. What makes this noteworthy is that Mr. Custer is sixteen years old. He’s from California, where you can’t even get a full driver’s license until you’re 18. And in New Hampshire, where he was racing, the most you can get at that age is a youth operator’s license. So The Curmudgeon would like to know how someone that young learned how to drive well enough to win a NASCAR race. And what kind of person puts a vehicle worth tens of thousands of dollars into the hands of a young man who could still be sleeping on Harry Potter sheets. And wouldn’t it have been funny if, as he was zooming around the track, a police officer had driven onto the track and pulled him over and demanded to see proof that he was old enough to drive. Okay, The Curmudgeon saw you roll your eyes when you read that title. Sit back, get a tall glass of whatever it is you like a tall glass of, and please continue reading with an open mind. People like to complain about the U.S. Postal Service (which The Curmudgeon will heretofore refer to as “the post office” because that’s what people usually call it). Yes, the post office has problems – major, major financial problems, some of its own doing, some most decidedly not. Most of the post office’s current financial problems were caused by Congress and Congress could undo them with a figurative snap of its fingers – which, you realize, Congress will never do, first because 535 pandering members don’t want to do anything that could get them on the wrong side of constituents who like to complain about the post office and second because a vote confirming that an hour consists of sixty minutes would probably draw at least 100 dissenters in that dysfunctional body. To be sure, the post office lacks a service ethic, as best illustrated by its hours of operation. Entities that want your business operate at hours convenient for their customers. Entities that don’t feel they need to compete for your business, or think you have no alternative to using them and expect you to conform to their own convenience, don’t. Doctors don’t have office hours at times most convenient for their patients; they have office hours at times most convenient for themselves. The same is generally true, with some exceptions, for lawyers, plumbers, electricians, banks, government offices, and many others. If there’s one major aspect of post office operations with which The Curmudgeon would quibble it’s the hours of operation at its public facilities: they are incredibly inconvenient for working people. On the other hand, The Curmudgeon has always marveled at the idea that you can slap a first class stamp on an envelope, throw it into a mailbox, and the envelope will arrive at its destination frightfully soon: the next day if the destination is relatively close and seldom more than three or four days if the destination is even across the country. Complain if you will about the rising cost of first-class postage, but The Curmudgeon has always found it amazing that he could toss a piece of paper into an envelope addressed to his father in southern California on a Monday morning, stick it in a mailbox before work, and receive a call from his father that Wednesday or Thursday or Friday at the latest to talk about whatever was in that envelope. Even at today’s forty-nine whole cents, it’s quite a bargain when you think about it. The post office has also greatly improved how it deals with forwarding mail. Nearly eleven years ago, when The Curmudgeon moved to his current home, he carefully submitted change of address information to every company he wanted to follow him across the river, and for the following six months, those he didn’t honor with this information continued to follow him, their offerings always adorned with a yellow label that screamed “post office forwarding service.” After six months the labels stopped, the old junk mail disappeared – to be replaced, alas, with new junk mail – and life went on. 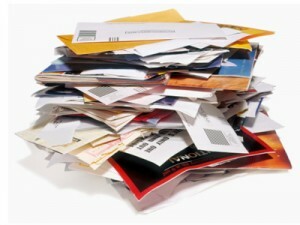 When his father passed away, The Curmudgeon arranged for all of his mail to be forwarded to his own house so he could be sure to take care of any financial affairs that might need attention. Now, as the one-year anniversary of dad’s arrives tomorrow, the yellow forwarding labels have disappeared, as he always knew they would. But the mail addressed to his father has not. In fact, it now comes addressed to dad at his “new” address: THE CURMUDGEON’S! That’s right. In its new efficiency, and in a manner that The Curmudgeon doesn’t understand, the post office has informed all of those purveyors of junk mail of their customer’s new address and they now think that dad’s a) still alive, and b) now living with his eldest son. And now, on a typical day, The Curmudgeon receives more mail addressed to his late father than he does addressed to himself. Dad made small contributions to Jewish causes and those causes obviously sell one another their mailing lists, so now The Curmudgeon’s mailbox is filled with solicitations from Jewish causes. It may surprise visitors to this site to learn that The Curmudgeon’s father was a political conservative – something he came to relatively late in life – so The Curmudgeon now receives appeals from all sorts of right-wing whacko groups (as distinguished from normal right-wing groups). Dad had long subscribed to a variety of health information newsletters, never quite grasping that the information for which he had long paid had now become readily available, without charge, on the internet. The newsletters continued to arrive, along with appeals from newsletters to which he didn’t subscribe. Dad didn’t make purchases through the internet. He would see something he wanted on the internet – usually basic men’s clothing and gizmos because he was a sucker for non-electronic gizmos – and write to or call the companies to get their catalogues. He’d then order their stuff and, seeing they had a customer, the companies would keep sending him their catalogues. As a result, The Curmudgeon now receives numerous catalogues every week. Haband men’s clothing? The Curmudgeon would ordinarily wisecrack here about how that’s stuff for old men, but then, dad did live to eighty-one. And charities – oh, the charities. And if a charity is writing to you, you know what it’s enclosing: address labels! Envelopes and envelopes full of address labels! Interestingly, when The Curmudgeon moved from one Philadelphia address to another back in 1990 he barely received any charitable appeals with address labels, but when he moved from Philadelphia to a tonier New Jersey suburb in 2003 he received a lot of them. The obvious conclusion of the charities: Philadelphians are all poor. But now The Curmudgeon has so many address labels with his father’s name on them but his own address that if dad were to rise from the dead tomorrow and live at this address for another eighty-one years he still would never, ever run out of address labels. The Curmudgeon knows this to be true because he’s resided at this address himself now for nearly eleven years and hasn’t even put a serious dent in his own supply of charity-provided address labels – and that’s after he’s tossed every envelope full of address labels that he’s received for the last five or six years. But this isn’t about the labels. It’s about the post office. Say what you will about the post office, but while you’ve heard people complain about it, you’ve probably never personally experienced one of those “lost in the mail” problems; the things you send through the mail always reach their intended destination. The service may not be friendly or convenient, but it’s good. And that junk mail is never, ever going to stop following you. Oh No! How Low, J Lo? Jennifer Lopez is a real star. She’s a well-established performer, and in more than one sphere of endeavor, too: she’s a successful and accomplished singer, dancer, and actor. So isn’t it sad that she still feels the need, at the age of forty-five, to make a music video with almost no actual music that seems to exist for the sole purpose of reminding people of her still spectacular, um, assets? Less than two weeks ago, a gunman ambushed two Pennsylvania state troopers outsider their barracks, killing one and seriously injuring another. Law enforcement officials quickly identified a suspect. Shortly thereafter, that suspect was added to the FBI’s ten most-wanted list. The suspect is known to harbor a grudge against law enforcement but has never been convicted or even accused of committing a violent crime. He did spend three months in jail for theft a few years ago. But aren’t there a lot – a LOT – more dangerous people out there than a guy who killed once but has no other history of violence and isn’t wanted for any other crimes? And doesn’t that make it look as if the law enforcement community has decided that it values the lives of its own more than it values the lives of those whom it’s sworn to protect? The New York Mets are a baseball team – and not a very good one. Even though they are located in the largest market in the country and have a still-shiny and new stadium and resources that dwarf those of most teams, their performance on the field has long been abysmal. The reason for their poor performance is clear: the team’s baseball executives, who in the past have essentially been handed a blank check to go out and buy the best players available, have done a very poor job of selecting the players to bring to their team. But this isn’t about baseball. Last week the New York Times reported about some of the team’s problems, including declining attendance. The people who know about selling tickets and raising attendance told the Times that there are a lot of things they can do to bring some more people to the ballpark but that ultimately, the single most valuable tool for bringing out fans is – you know this – a successful team that’s fun to watch. Having a successful team in baseball is a matter of going out and buying the best players, and the Mets have long had the money to do just that. But will they? General Manager Sandy Alderson has indicated that the payroll, about $89 million this season, will increase only when the attendance does. So in other words, when the fans start coming to the games to see the bad team, the team will go out and spend more money on better players and try to field a better team. Excuse The Curmudgeon, but don’t the Mets have it backwards? Isn’t the usual path to business success that a company invests in making a great product, it engages in marketing to show off that great product to prospective customers, and many of those prospective customers become paying customers because they’ve come to realize that the company has a great product worthy of their patronage? After all, did Apple tell the world, “Start buying our Macintosh computers and we’ll invest that money in the development of new products? And did Procter & Gamble put out a lousy toothpaste and tell the world that if they used that lousy toothpaste it would develop Crest? Of course they didn’t. But the Mets apparently feel they don’t owe their fans a great product at all, that instead, the fans owe the Mets their patronage in the form of attending games featuring a lousy team and that if those fans turn out in sufficient numbers, the team will turn around and try to field a better team. The Mets deserve their fate – and their fans deserve better. Although as a Phillies fan, The Curmudgeon must admit that he’s pretty happy with things the way they are right now.